Scarves are one of the easiest ways to add style to your wardrobe. A well-chosen scarf can add instant polish to any wardrobe, no matter how basic by bringing in new colors, patterns, and textures. Scarves extend your wardrobe and let you play with new patterns and colors you might shy away from in a top or dress. We’ve put together a guide on how to select and style scarves so you can wear them in style! First, here are the basic types and shapes of scarves. This size is really easy to wear which is probably why it’s the most popular. It often comes in 30″ x 80 but you’ll see it in many other variations. Rectangle scarves often come in knits and wools, rayons, viscose, silk, or cotton. Square scarves are usually made in lighter materials like rayon, silk or soft cotton. You’ll find these scarves in squares as large as 60″ x 60″, and often in smaller sizes called neckerchiefs. An infinity scarf is a circular scarf with no ends. This scarf is sometimes called the closed loop. You’ll see infinity scarves in heavy knits and cables for winter, or lightweight cotton, linen, or rayon fabrics for summer. Infinity scarves are especially great to wear if you’re wearing a jacket with a zipper since they don’t have any ends or fringe that can get caught. Pashmina is a very particular fabric. It’s made from the belly hairs of the Tibetan goat (I kid you not!) Explains why these type of scarves are so expensive. Pashmina scarves often come in solid colors with fringe ends, and are large enough to use as a wrap. 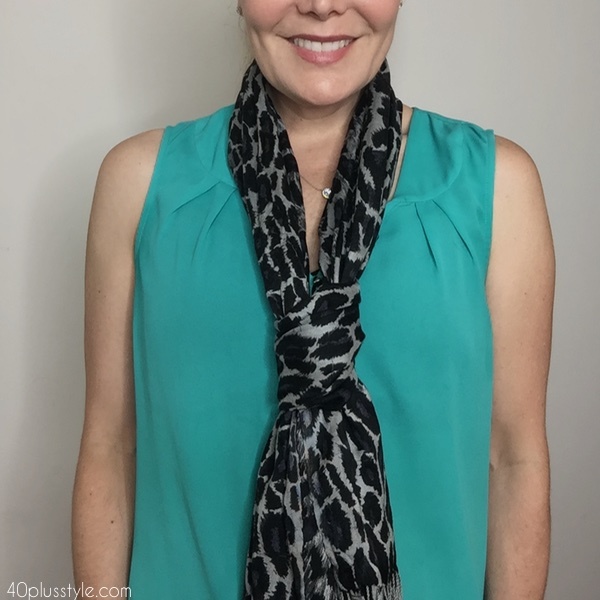 There are many similar styles that are rayon/silk blends and therefore less pricey, but with the solid colors and fringe and so they are still called pashminas. Blanket scarves are extra large wool blanket patterns that are worn as oversized scarves, ponchos or wraps. You can always secure them with a stylish broach, or hide a safety pin under the layers if you don’t want it to be seen. 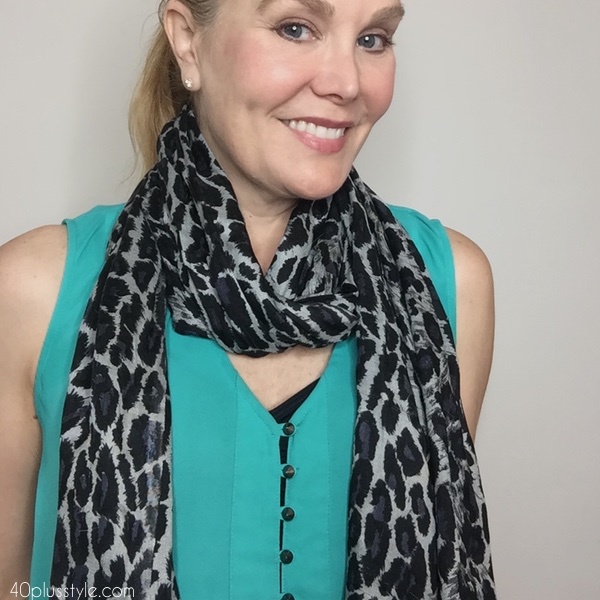 A basic scarf wardrobe should include a rectangle scarf in a heavier weight for winter, and a lighter cotton or rayon/silk rectangle scarf for summer. Choose a scarf in a bright color or fun print to add fun and pattern to your warm weather wardrobe. 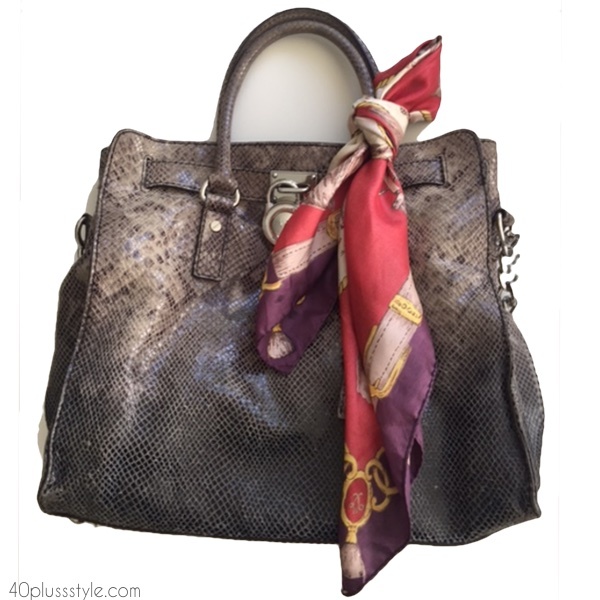 Select an infinity scarf in a large print or pattern that can be worn over jackets with a zipper. 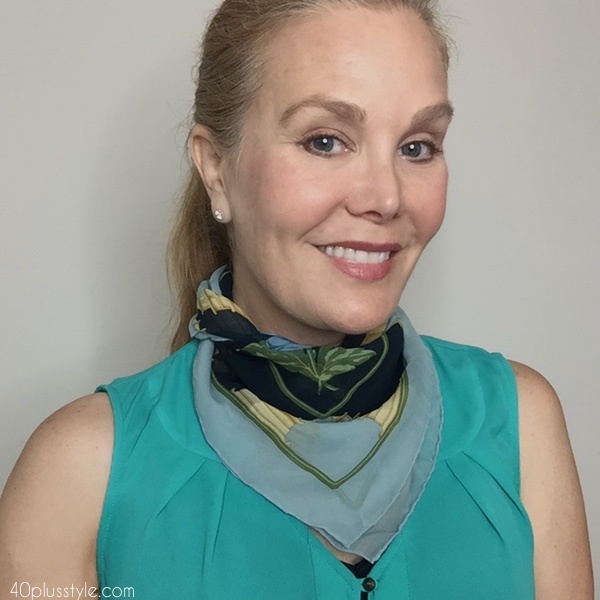 Make sure you have a square silk or silk blend neck scarves. 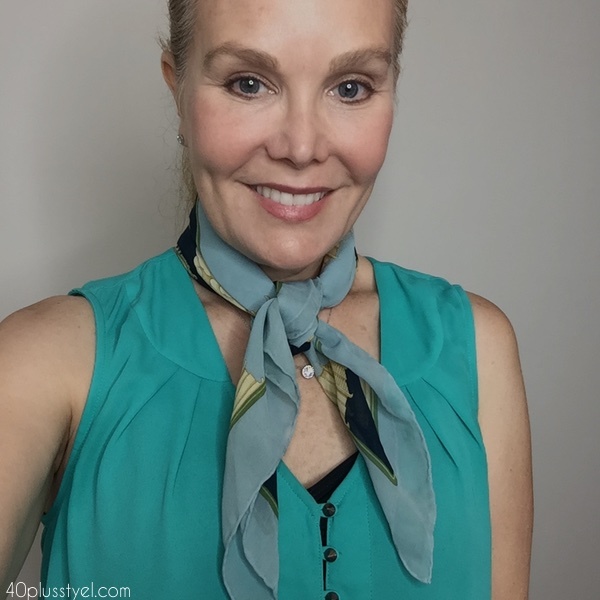 A neck scarf can be extremely versatile (as we show below). If you are petite, select scarves that aren’t too long so the scarf won’t overwhelm your smaller frame. Here are several basic ways to tie a scarf. 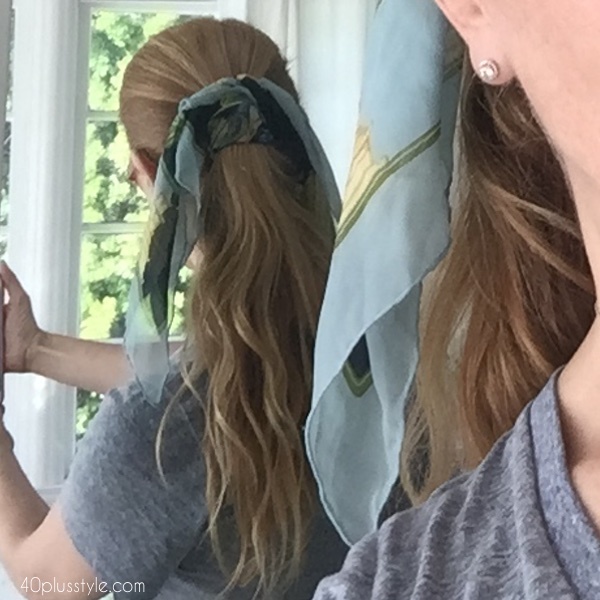 One of the easiest and most stylish ways to tie a scarf. Create a loop with one hand, put the scarf around your neck, and thread the ends of the scarf through the loop. You can wear looser or up closer to your neck when it’s chilly. Simply drape the scarf around your neck and loop the ends back around to the front. Tie in a loose knot the same way you’d tie a men’s necktie. You can adjust the knot up or down to make it lower or higher. Wear with the triangular ends of the scarf frontways, wrap around your neck, and hide the ties underneath. Easy and tres stylish! You can find some of our favorite scarf picks available in stores nowbelow. PS. Want to learn even more ways to up your style game? 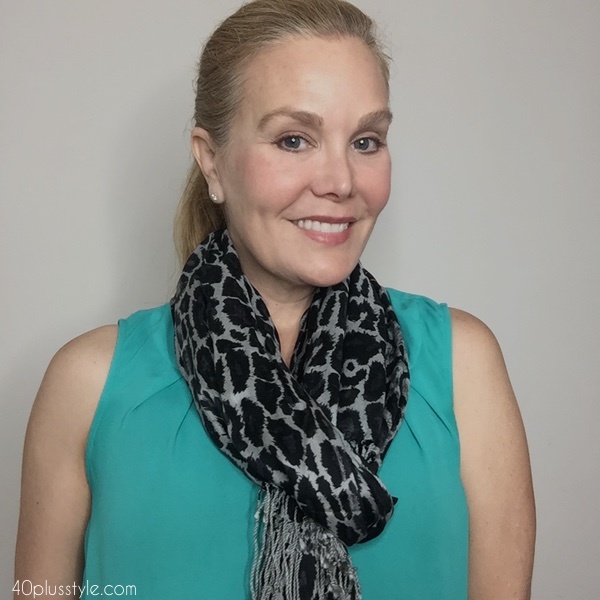 Join the 40 Plus Style Club. There is lots of training on accessories and how they can truly elevate your style! I love video on how to tie a scarf. I always tell woman to buy a couple of scarfs. I like to go beauty supply store and buy one have to about four dollars. I got pink , blue and pink big scaft and black square. If money is tight raid your mom and grand mom scaft collections. I work as receptionist and I can wear jeans to work. So in winter and fall scafts can make outfit look competly different. I tie my scafts in different ways. Veronica, so glad you enjoyed it. I so agree with you about buying scarves, I’m always picking one up and they don’t have to cost much either. I have several scarves from my grandmother too and love them because they are pretty and remind me of her! I gave up on scarves. A few styles I have mastered but most of the times scarves just hate me. Leave if it is windy or damp. A very long scarf or muffler can be draped over one shoulder and left to hang both front and back on. You could wear a belt to secure in place if desired. Just make it up as you go!!! Tie ends on same sides of a large square in small knots. 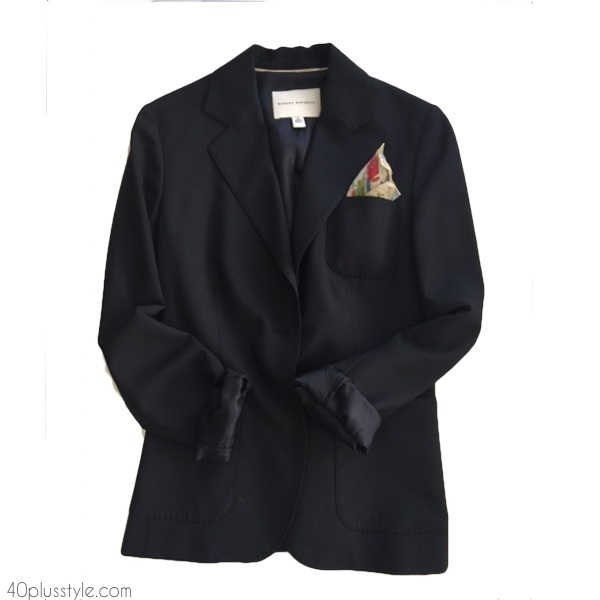 Slip arnscthrough openings and make a blouson wrap. Etc Etc. Etc.